THE Model 279 converter, available from Boston Technology , provides transparent conversion between fibre optic devices utilising multi-mode fibre and those with single-mode fibre. Single-mode fibre can transmit data over much longer distances than is possible with multi-mode fibre. It accomplishes this by limiting the amount of power lost through leakage in the walls of the fibre and using 1300nm wavelength emission which has less attenuation than 850nm. Thus, the converter regenerates signal strength and is used to extend the distance far beyond the specification for multi-mode fibre. The Model 279 can also be used when the optical fibre type of the equipment is not compatible with the installed fibre optic cable. Features of the Model 279 include the ability to operate from dc to 2.5 Mbps. This allows a variety of applications to take advantage of the transmission capability of the device and fibre cable. A loss budget of 15dB is provided which equates to a distance of approximately 20 kilometres. Since operation is allowed at DC there is no clocking information that the Model 279 can use to perform automatic gain control. Therefore, the gain is user-controlled by a Line Loss switch and, once set, does not have to be changed. Once the single-mode line is installed its length is fixed. Four positions on the Line Loss switch allow selection of 2, 5, 10 and 15dB of loss. Four LEDs are provided to give a visual indication of the selected line loss. The units are used in pairs, interconnected on the single-mode side. 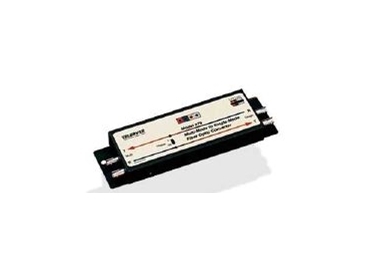 The Model 279 is powered by a wall-mounted dc adapter that develops 12V. By use of an internal dc-to-dc converter the user can supply any dc voltage from +8V to +36V for those situations where ac is not available. The fibre optic ports of the Model 279 are provided on ST connectors. The product is designed for inline mounting. Its relatively small size allows for placement in virtually any installation.